I really need some sleep. My laptop screen is glaring in Eli’s trying-to-sleep eyes. He is patiently trying to sleep as I type sitting in the bright blue chair next to him. He pauses, “Hey Dad, do you have one of those thingies you put over your eyes?” Alas, Dave does have one of those thingies. He gets out of bed, unzips something, and walks the eye mask over to Easy E. It’s been a long day, and it’s been a good day. It started with Doris and ended with Mango Sticky Rice. Say no more, right? I was up a the crack of dawn. We wanted to make our way to Leeds, stopping at Birtish Heritage Attractions along the way. The laundry also needed to be done. I was up, showered, Dave and I were out the door and on our way. We solved the mystery of the missing Laundromat. They are building a Tesco in its place so the Laundromat people hit the road. We found this out when we asked the folks at the Co=op grocery, who then directed us to the nearest laundry in the town of Lydney (seven miles away). Before I found out about the laundry, I also learned that apparently in Coleford, England, you do not leave the house with wet hair like I did this morning. After the dude sitting in the grocery store made the comment about my wet hair, I asked him if leaving the house with wet hair is common. He said, “no.” Then paused and said, “it’s really quite fetching.” I said with a laugh, “I really don’t think so.” To which he said,”what country are you from?” Crazy America, where people leave the house with wet hair and no, I did not say that out loud (hence the lack of quotation marks). I did tell him, “Utah.” I should have mentioned the well-known Utah Big Hair, but I did not want to complicate things. As Dave and I wheeled our dirty clothes-filled suitcases up to the Laundromat, Doris, the launderette was standing there. It was 8:44 AM. “The Luandry isn’t open yet. You are lucky it is me working today instead of the other woman. She would never let you in before 9:00 Am. Once I have the door open, come on in.” Standing before me was my Grandma Koener reincarnated onto this lovely British woman. I am not kidding. Someone somewhere knew I needed this little slice of heaven in the form of an tall, elderly British woman, wearing a pink gingham checked smock. 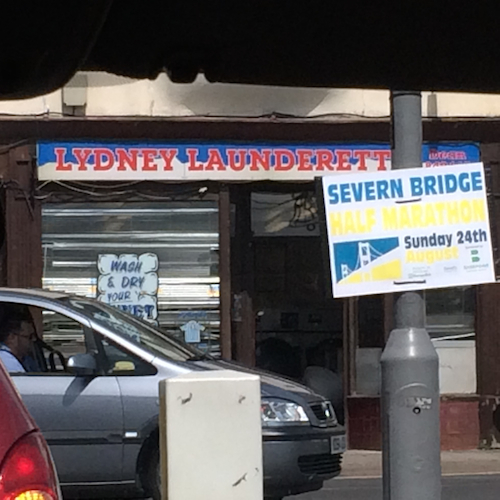 The Lydney Laundromat may be the best part of trip. Not only did Doris, Jo, a regular customer, and Mary, the Canadian, help me with my laundry, they welcomed me into their world. I met Mary. I met the dancing town guy and the thin old lady wearing high heeled Wellies. Like a perfectly cast episode of Downton Abbey meets Monty Python I was spun into this episode of the Lydney Laundrette, with a plot line that goes something like this because that is how it really went. Crazy American Women overdries her clothes. Burned Pajamas ensue. Best part was when Doris talked about and I quote, “the Facebook,” and cellphones. As for cellphones Doris thinks we should grab all the cellphones and throw them in the river. As far as “the Facebook,” goes Doris wonders and thinks it is slightly idiotic that we need to know, “her baby laughed today. or I went to the store. ” She grimaces and says, “why do we need to know all of that? I’d be done with all of it.” I know she ate lasagna for dinner tonight, and I know she loves to dine out, even though her husband does not like to. She is a sweet, hard working, feisty ball of love, and so was my grandma. I am grateful for moments like these. While I was do ing laundry Dave drove back to the cottage we were staying in, packed us all up, and two hours later, he, Grandma and the boys met up with me. We only left one thing and decided it was not worth retrieving — a top sheet. Dave brought me the yummiest tea. I love him. Today feels better and was better. Waitrose Rest Stop. Wasn’t going to stop until Dave mentioned there was a Starbucks. I am glad we did. WaitRose. We ended up eating here. British Pot pies are giant. They had one package of dark chocolate covered rice cakes left. Hallelujah! Kenilworth Castle. I learned about birds and the whacker, a brutish heavy and sharp sword. It is a “strike first” implement and I love it. Things like a couple of clandestine make-outs at Kenilworth Castle always makes Mommy smile. Leeds and our disco hotel, a very good hotel indeed. Why doesn’t FaceTime ever work? And we end the night with Thai food. Yum! Ahh…Doris! She sounds delightful and wonderfully open/honest. And that is my sweet grandmother’s name. She still lives in Germany. Sounds like a great day! Andrea, it was a great day. Thank you! I love that Doris is your grandmother’s name to. So cool. Also love that she lives in Germany! Awesome!